Music and Dance classes are part of the curriculum for students of Classes II to V.
Dance is a form of creative expression and requires intense and perfect body and mind co-ordination. Indian Classical dance, rooted in an ancient culture and tradition, is also an excellent form of exercise which develops speed, strength, stamina and flexibility in children. Children are taught Basic steps of Bharathanatyam, Hastas and Mudras. Class IV and V have theory lessons on dance. They are exposed to ‘Abhinaya’ though small dances set to songs that require expressions. Children are also trained for the annual day programmes. Music has the unique ability to enhance the cognitive functions of the mind such as attention, memory, perception, concept formation, problem solving, abstract thinking, emotion and sensory motor control. Music also has wonderful therapeutic powers to relieve children. Beyond all this it allows children to enhance their creative skills and take delight in creation of music which in itself is a joyous experience. Hari Shree Vidyalayam’s music curricular program has been founded under guidance from Brhaddhvani, a non-profit organization based in Chennai. The institute, founded in 1989 by Prof. Karaikudi S Subramanian, is a research and training centre for music of the world. It opens up music to everyone and believes in holistic music education – combining art and science, tradition and technology, keeping a global context in mind. Brhaddhvani’s methodology and curriculum named COMET (Correlated Objective Music Education and Training) has been implemented from the academic year 2012. COMET is aimed at developing musical intelligence holistically and is based on an outlook that emphasises on the process of learning rather than the outcome. The program works towards creating awareness and passion for music in children; it will engage them in the creative exercise of making music rather than preparing themselves for stage performances. Dr. Karaikudi Subramanian’s research and world music experience envisages the innate connection among musical styles and art forms as the definition of this program. COMET has proven to be a powerful and efficient way of bringing Indian music education on to a school platform to complement the regular curricular stream. The organization’s faculty works in tandem with the school’s music facilitator in rendering the lessons and monitoring the effectiveness of the program. Dr. Subramanian also works with Tamil and Sanskrit teachers at Hari Shree to co-relate music education with the child’s educational process. Guest lectures and special workshops are held during the academic year. To read more about Brhaddhvani and COMET please visit: www.brhaddhvani.org. The Madras Youth Choir organized a Choral Singing competition for schools. The event was held at the German Hall. Students from Hari Shree Vidyalayam participated in the event. Though they could not secure a position in the first three places, they put in a commendable performance. The students were trained by Mr. Gopakumar and Mr.Ashok, the school music teacher. 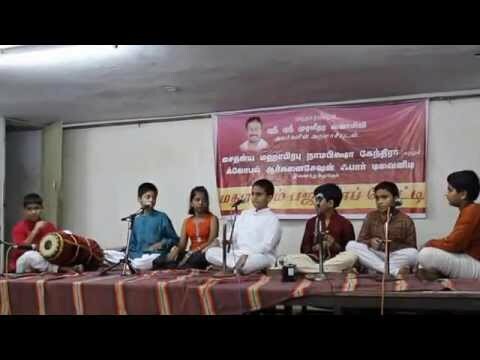 The Global Organization for Divinity (GOD) India Trust, in association with Sri Chitanya Mahaprabhu Nama Bhiksha Kendra organized the Madhurageetham Festival – a Bhajan competition for 7 to 17 year old children on a collection of divine kirtans written and composed by Sri Sri Muralidhara Swamiji. This group event saw the participation of 32 students from CHSV, from classes III, IV, V and VIII. Please watch the video below to see our students render melodious bhajans.